Not too long ago, the professionals at Superior Signs and Graphics were called in to manufacture and install a collection of nine showroom display panels. Orange County’s Eurowest Showroom is in the business of helping customers envision high-end masonry products in their homes. These graphics are not your typical small pictures that give you an idea of the product. Rather, they are floor too ceiling posters that look so real that you almost want to take a step closer into the model room setting. An innovative way to showcase your products! The management team of Eurowest Showroom called us again. This time, we were asked to install a couple of larger product showroom vinyl graphics display panels. 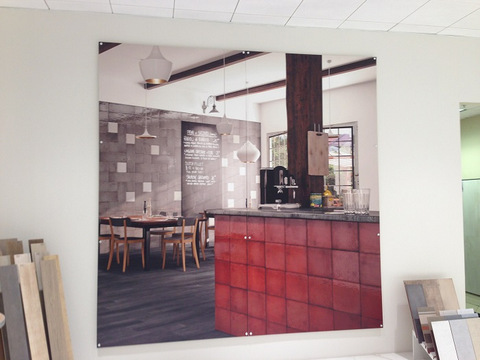 Orange County’s masonry experts wanted to update the look in their West L.A. showroom. They had two five-foot by 10-foot PVC panels that were outdated. A new set of panels was to provide an updated look and create a continuous image when installed side by side. We relied on our digital printer for a crisp image. A matte finish ensures that no glare from lights diminishes the view for customers. We finished the job with brushed aluminum standoff mounts. More and more retailers are walking away from the paintbrush and the manufacturer-provided posters. 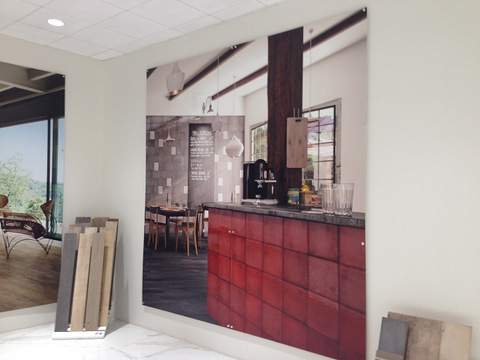 High-end retailers in particular are looking for one-of-a-kind vinyl panels to market their products while branding the business in the process. By controlling the look of the store or showroom’s backdrop, these companies succeed at creating expectations in their customers that the other wall coverings simply cannot compete with. 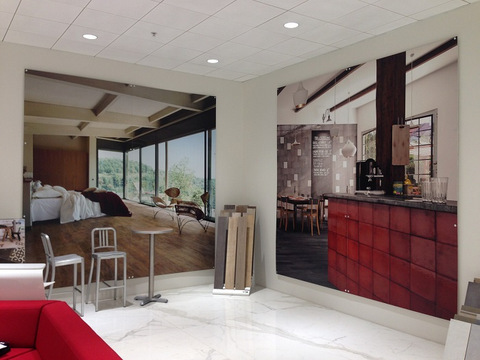 Vinyl wall murals are also space-saving for your showroom! But vinyl wall coverings do more than simply create breathtaking backdrops for any retail environment. They also have the power to take over signage functions. Whether you need a lobby sign, point of sale marker, wayfinding signage or similar products, this material can make it happen. Retailers in warehouse store settings have discovered that this product solution is an excellent mans of covering the otherwise industrial walls and providing oversized markers without an oversized price tag. In addition, these signs make it easy for customers to find their ways around, which of course cuts down on the help that the staff has to provide. Talk to our friendly professionals about the images that you are envisioning. If you have been thinking of dramatically changing the atmosphere of your storefront, then vinyl graphics display panels are an excellent choice. They add depth and texture to a room that no paint can hope to imitate. In addition, they install quickly, which ensures that you stay open and do not inconvenience shoppers with pesky paint fumes. We gladly come out for a site evaluation and to take measurements. Ask us about dressing up your showroom! Show us any artwork that you already have on hand. If you do not have anything in place yet, we can help you find the ideal images for your venue. Next, we sketch out the proposed mural look for your approval. When you are satisfied that we have captured your vision, we produce and professionally install the panels according to your specifications.